For the past several months, Apple-leased Dodge Caravans with equipment-laden roofs have been spotted driving around the United States. While early speculation suggested the vans could be Apple's first attempt at developing a self-driving vehicle, it quickly became clear that the vans were being used for mapping purposes. The Dodge Caravans are all outfitted with an array of LIDAR cameras, much like the vehicles that Google uses to capture images for its Street View mapping feature, so it is no surprise that a report shared today by 9to5Mac suggests the images and data from the vans will be used for future improvements to Apple's Maps feature. 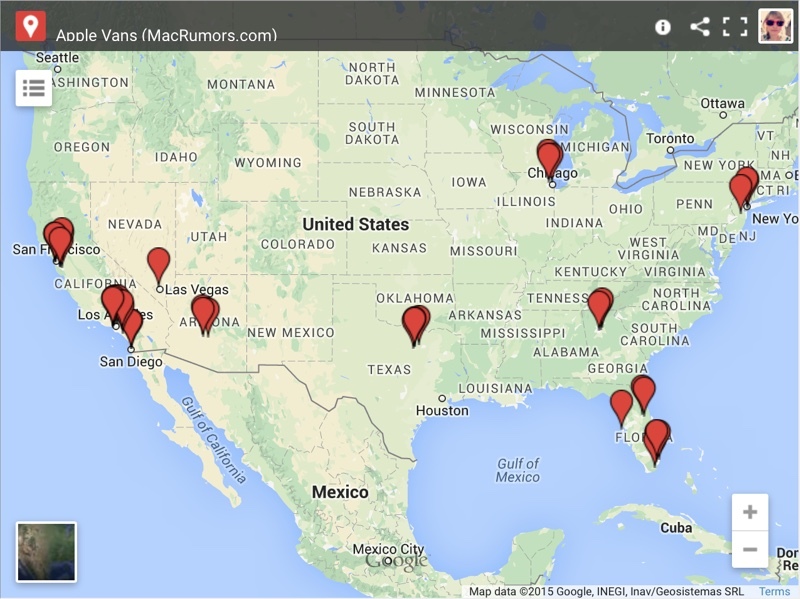 Here at MacRumors, we have been aggregating Apple van sightings to give a clear picture of the areas where Apple is currently focusing its attention. Apple has worked tirelessly to improve the Maps app since its 2012 launch, fulfilling Tim Cook's promise that Apple would work "non-stop" until Maps met its "incredibly high standard." The next step in Maps' evolution is the gathering of in-house data to reduce reliance on third-party companies like TomTom, which has provided data for Apple Maps since it launched. Just this month, TomTom and Apple renewed their mapping contract, so Apple's shift towards its own data system may still be several years off. Using in-house data has the potential to significantly improve the Maps experience. Apple will not have to rely on third-party information that's potentially riddled with errors and inaccuracies, and the company will also be able to implement changes and fixes more quickly. We may see the first fruits of Apple's new mapping project as soon as June 8, when Apple unveils iOS 9 at WWDC and provides it to developers for testing purposes. iOS 9 is rumored to have a few other upgrades in addition to a new Points of Interest system, including transit routing information in a limited number of cities. Hopefully, they won't be using Apple Maps for navigation. I wish Apple let us choose Google Maps as our default mapping application. I'd love to ask Siri for directions but she can never find what I'm looking for or her directions are wrong. I'm in Canada so I don't get the reliability of US Apple Maps. Google's main function for many years has been searching and maps. Of course they're better at it. That's all they do "well". I've said time and time again here that Flyover has so much more potential than Street View solely because of the fact that its free-axis. This allows for much more functionality and efficiency. Everyone on here over exaggerates Maps shortcomings so massively lol. Pretty funny. I do. Been using Apple maps from the early beta days without any issues. Since Google apps are always inefficient and CPU hungry, I would love to use Apple integrated services. Would be so great to have a reliable version of the Maps app. For now I'm mostly using Google Maps. So what if its not your default app, take 5 seconds out of your precious time and click on Google Maps. If you want Google Maps integrated, then go buy an Android phone. Simple as that. what is with your condescending attitude? your previous post was an example of cluelessness and myopia and i pointed you towards the answers and the truth. then you start moving the goalposts. fact of the matter is that almost 3 years ago apple described their maps app as the most beautiful, powerful mapping service ever. users deserve that and if apple cant provide that then give us the option to choose something better as the default option. then you can choose not to change your setting. who was in control before? if you are not sure then just look 2 posts above you. forced is exactly the situation that people are in.